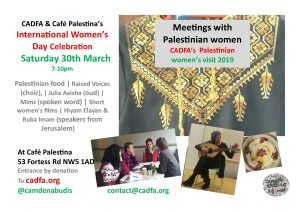 Some of your readers will know that CADFA (Camden-Abu Dis Friendship Association) has organised women’s exchanges between Camden and Palestine every year since 2006. This year’s visit runs between 22nd March and 1st April and we think that your readers may be interested to come along and meet them. CADFA often hosts visitors from Palestine: school children, students, women, musicians and others. For the past ten years these have very often been part of EU-funded youth exchanges. As part of our work, we often travel with our visitors to towns across the England and Wales. Numerous councils, of every political hue, have sent their Mayors to meet our visitors, but it has been sad that, for years, our own Camden Mayor has not met our visitors. Once again this year, we are disappointed that the Camden Mayor cannot come to any of the local women’s events we are organising or to meet our visitors at any point while they are here. Camden is the centre of CADFA’s work, of course, and the grassroots links between Camden and the town of Abu Dis in Palestine are very special. This visit is partly funded by the hard work of CADFA women’s links who run a stall at the Brunswick Centre every Saturday to sell Palestinian pottery, embroidery, olive oil and speciality foods. Posted on March 22, 2019 by CADFA.